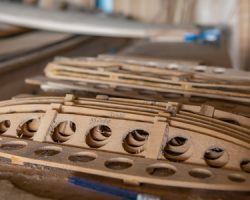 We pride ourselves on the craftsmanship and art of our wooden surfboards and look forward to every day we are on the water. 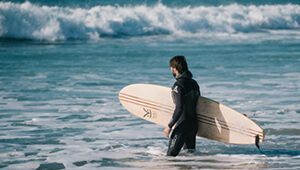 But, we are just as interested in our impact on the environment and finding ways to educate the public on living an eco-friendly life as we are to go surfing. 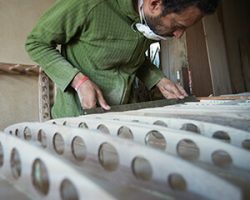 Along with making boards, we are focused on making sure that we create the best environment we can for future generation. 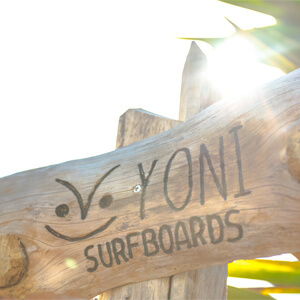 As the founder of Yoni Surfboards, Ze, says “when I was growing up surfing was spectacular, the water was less crowded and the beaches were cleaner, but now when I go to the beaches they are littered and I see the trash cans full with broken boards, and all of this just goes into the landfills.” This was the motivation behind Yoni wooden surfboards and now we are proud to say we are using surfing to help highlight and communicate an eco-lifestyle and even more proud that the sales from Yoni boards go to help support educating future generations in Portugal. At Yoni, it’s not just about making beautiful, fun boards; this is the secondary reward from our labor of love. 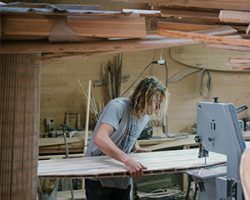 For us, it is about making boards that leave less of an impact on the environment. It is about lowering our waste in landfills and using a sustainable resource. This is why we choose wood. It is playful, you can shape it easily, and most importantly we have the ability to replenish it at a higher rate than we are use. Through this, we are cutting down on transportation pollutants. We can also choose raw materials that we know were grown and harvested with the smallest negative impact possible. Along with this, we use Bamboo and Agave because of its ability to grow and mature quickly. Most importantly we replenish at a much higher rate than we take. 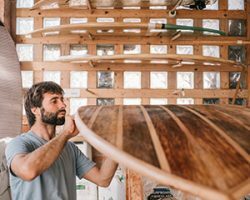 From each tree that we harvest we can produce on average 20 surfboards, this varies depending on the board’s length and shape. 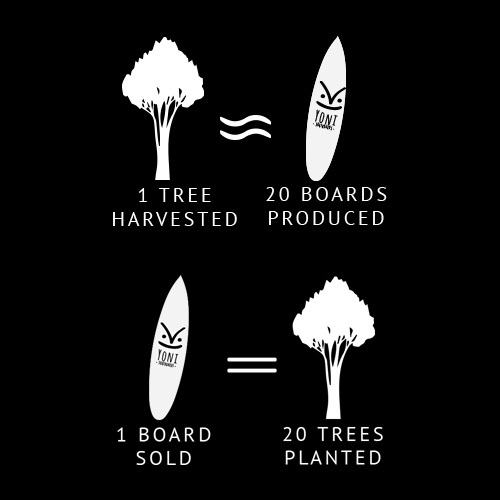 For each board that we sell we replant 1 tree. Our regard to producing from nature is that our replanting and replenishing needs to be a much higher rate than we are taking. 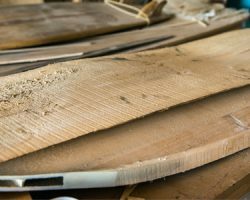 As we shape our boards we select each piece of wood for the decks and bottoms specifically. This allows us to not only ensure patterns are beautiful and unique but we can also select pieces that are used to the fullest. 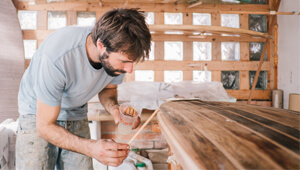 Scraps from patterns are used for inner-ribs, leftover sawdust helps to shine and polish finished boards, and with our intimate knowledge of grains, even small pieces can be seamlessly combined into beautifully stripped decks. 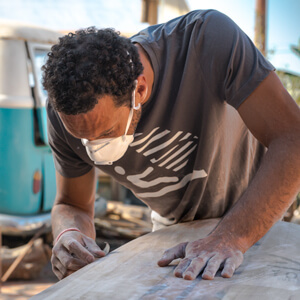 As we actually craft and produce the boards themselves more than 50% of the process uses hand tools. From planning decks, to setting molds, to shaping rails; wherever it is possible to utilize the precision of powerless hand tools we do. This not only helps to cut down on our electrical intake it allows us to work intimately with each board, making it an individual piece of art that we are proud to call a Yoni. 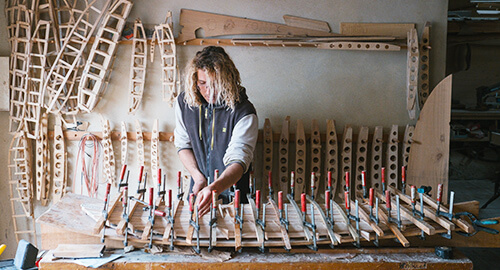 Yoni surfboards were born out of Ze’s love for craftsmanship and nature. 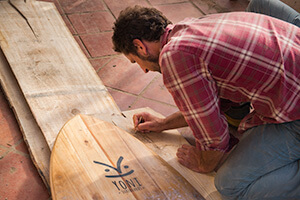 Each board is handcrafted in Portugal in the Yoni workshop located between Obidos and Peniche. 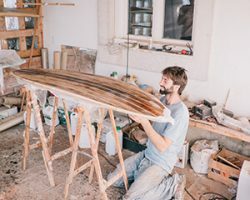 Our surfboard shaping is focused on utilizes local and sustainable materials with the goal of producing fun, playful surfboards that have a minimal impact on the environment. 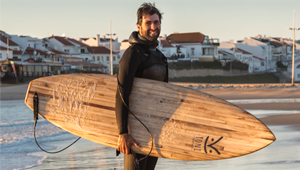 As a lifelong surfer from Portugal, Ze grew up at the beach, he has traveled the globe seeking waves and has watched the sport evolve. He has also seen the amount of waste and unrecyclable materials used in surfing increase and knew there had to be a different approach. 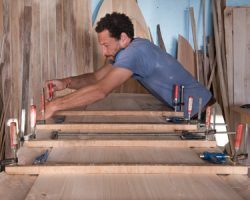 This is what motivated Ze to begin shaping boards and what led to the start of Yoni Surfboards. 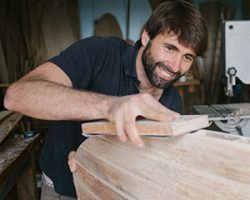 At first, it was just a passion project – playing with shapes and materials in his wood shop but then it quickly started to grow. 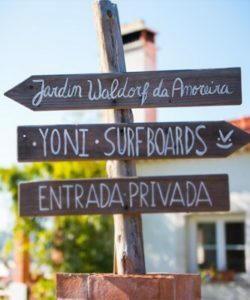 A friend here and a friend there asked for boards, then surfers traveling to Portugal were interested in the wooden patterns. 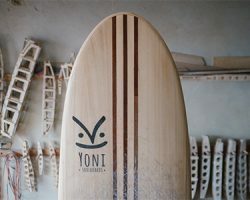 Eventually, there were requests coming from the surfers across Europe and all of a sudden Yoni started to take shape as a brand. 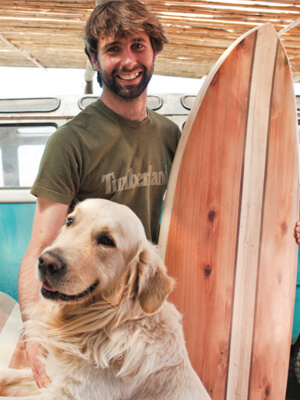 The main importance to Yoni surfboards is and always will be to use sustainable, locally sourced materials. All of the wood comes from a small harvest on Ze’s father’s land in Central Portugal as well as the land of a friend’s father. It is here that Yoni continues to plant and replenish trees for every board sold. 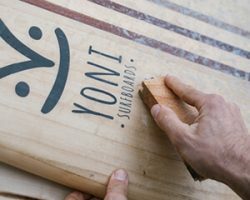 For Yoni it will always stand that producing surfboards is about lowering the impact on the environment, replenishing nature, and educating the public on how to lessen ones environmental impact. This ethos is not only in the boards we produce, but also in the programs we run, and the education we support. 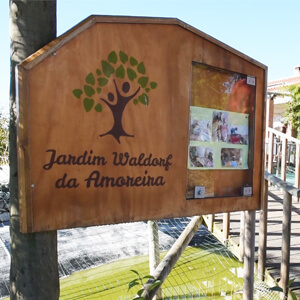 The Jardin Waldorf da Amoreira is next door to Yoni and deserves our special mention. We believe first-hand education is the best way to understand our impact on the environment and while we use surfing as a tool to talk with adults we find it even more important to share this message with children. This is why from the first board sold Yoni has donated money to the Waldorf school. Since then the school has steadily grown with children from across western Portugal and our support and enthusiasm has not wavered. Donating to the school is something that we strongly believe in and a service we will continue to do with every board we sell. 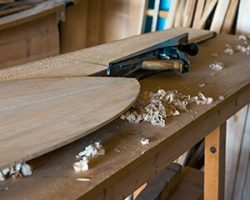 We pride ourselves on the craftsmanship and art of our wooden surfboards and look forward to every day we are on the water.